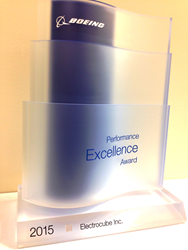 Electrocube announced that it has received a 2015 Boeing Performance Excellence Award. The Boeing Company issues the award annually to recognize suppliers who have achieved superior performance. Electrocube maintained a Silver composite performance rating for each month of the 12-month performance period, from October 1, 2014, to September 30, 2015. The Awards are given each spring of the following year. This year, Boeing recognized 530 suppliers who achieved either a Gold or Silver level Boeing Performance Excellence Award. Electrocube is one of only 423 suppliers to receive the Silver level of recognition nationally. Electrocube supplies autotransformers to Boeing for both commercial and military programs. This year’s recognition marks the ninth consecutive year Electrocube has been awarded this honor. A supplier for Boeing for 35 of its 53-year history, Electrocube has earned a well-established reputation within the aerospace industry as well as the audio, environmental, industrial, transportation, medical and military industries. Founded in 1961, Pomona, CA-headquartered Electrocube, Inc. is an award-winning engineering design, manufacturing and sources servicing company of passive electrical components including film capacitors, audio-optimized film capacitors, high temperature capacitors, RC Networks, foil transformers and custom EMI Filters for a wide range of standard and custom applications. The company is second-generation owned and retains all operations – from manufacturing and design to delivery – within the United States. Electrocube is known for its signature, custom precision and superior quality control/testing in a number of client industries including: aerospace, appliances, audio, commercial, equipment controls, environmental controls, industrial, medical, military, renewable energy, test equipment and transportation. For more information, visit: http://www.electrocube.com.